Bath and Body Works is one of those American brands that we just wish we had over here in the UK, and their candles are said to smell heavenly. Alas, no one at the brand have heard our cries and we still have to resort to eBay for our B&BW fix. 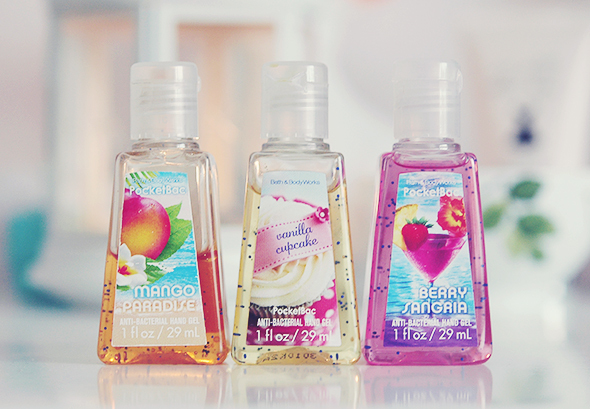 I actually spotted these PocketBac gels a few weeks ago on Becky's blog and I couldn't resist making a cheeky purchase. Fast forward a week later and I ordered another two, they're such great handbag friendly products! There's a huge array of different scents to choose from and I just cannot emphasise how incredible they smell. My favourite out of the three that I have is Vanilla Cupcake, closely followed by Mango Paradise, but you can choose from anything from cake to fruit to bubblegum. I just can't get over how good they smell, I must look like a right idiot constantly sniffing at my hands haha! They are, I could become a serious hoarder with these! These really are so great to have on hand; I'm by no means a germophobe when I'm at work (retail) it really kicks in haha. And they do smell heavenly!! Haha I'm the same, although it's public toilets that really get me, eurgh! I'd love to give their other stuff a try but the bloody Atlantic is in the way haha! I got loads when I was in the USA last year and I love them! Thank goodness I can get some more on eBay when I run out. Haha, they are a little bit pricier over here but at least they're accessible! I wish we had Bath and Body Works in Australia too! I'm always hearing about how amazing their scented products are :) Good to hear the fragrance really lasts!